A storm of virtuosic perfection awaits! Rolston String Quartet excites with String Quartet Classics from Haydn and Beethoven with the distinct Canadian sound of Murray Schafer. Rolston String Quartet has stormed onto the international classical music scene with First Prize wins at the 12th Banff International String Quartet Competition and at the 31st Chamber Music Yellow Springs Competition; and in 2018, they received the prestigious Cleveland Quartet Award from Chamber Music America. Featured on CBC’s 2016 list of hot Canadian classical musicians under 30, Rolston String Quartet’s performances have taken them throughout the U.S., Canada, Europe, and Israel with highlights in venues such as the Smithsonian, Kennedy Centre for the Performing Arts and Austria’s Esterhazy Palace. Their program includes Haydn’s “Sunrise” quartet, with its dawn invoking themes, Murray Schafer’s “Waves;” an ocean soundscape in music, and Beethoven’s ambitious “Razumovsky” Quartet. 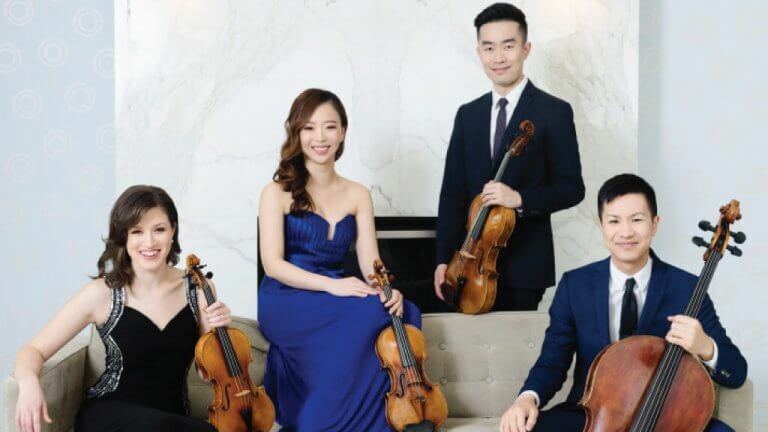 Rolston String Quartet performs “with a maturity and cohesion rivaling the best string quartets in the world” (Musical Toronto), making this a must-see concert! Rolston String Quartet is endorsed by Jargar Strings of Denmark.